A singular occurrence in gastronomic science was tried on Tuesday week, on the ice in the centre of the River Exe, at St Thomas. The severity of the frost having coated the surface of the river with a thick crust of ice, capable of bearing several hundred persons, who skated and otherwise deported themselves thereon for hours, near the bridge. It occurred to Mr. Vickery, stove manufacturer, Fore Street, that a dinner might be cooked by gas in the centre of the ice-bound stream. The suggestion was seconded by Mr. Hox, of the Seven Stars, and in less than an hour several of the workmen from Mr. Vickery’s establishment had laid down gas pipes from the street main to the middle of the Exe, where the gas supplied a number of little jets in one half of Mr. Vickery’s improved cooking stoves. In this apparatus a large piece of beef and some poultry were roasted; and a leg of mutton and vegetables, a large Devonshire dumpling, and other etceteras were boiled. The dressing process occupied about an hour and a half, and was witnessed by a large number of persons. The dinner was afterwards served up at the Seven Stars, under the presidency of Mr. J. Hallett, when between 20 and 30 of Mr. Vickery’s friends partook of a capital repast, and spent a very convivial evening. The meat was admirably roasted, and the experiment altogether was as successful as it was novel. 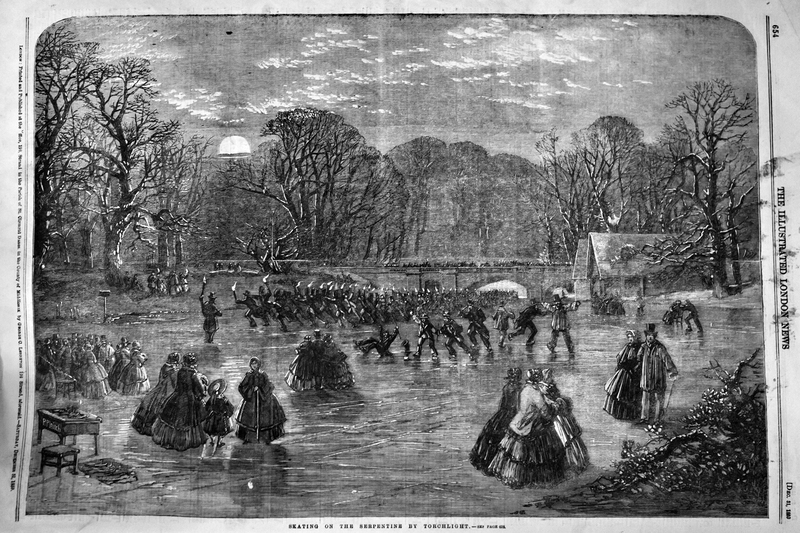 Image above is from the Illustrated London News, showing ice skating by moonlight on the Serpentine in Hyde Park, a few years after the River Exe Roast.